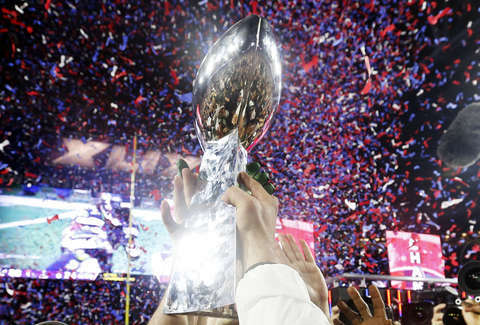 The Los Angeles Rams and the New England Patriots just punched their tickets to Super Bowl LIII, but thousands of people have already -- and soon will be -- clamoring for tickets of their own. If you want to be there at Mercedes-Benz Stadium in Atlanta on February 3, you'd better act fast. Super Bowl tickets are notoriously expensive, and prohibitively so for most people, but that doesn't stop diehard fans from doing everything they can to try and score a good seat to the biggest game of the year. However, Mercedes-Benz Stadium can only hold so many people (71,000 to be precise), so competition is tight. If you're itching to be there, or just curious how much it'd cost, here's what you need to know. How Much Are Tickets to the 2019 Super Bowl? Getting to see all the action on and off the field in person is not cheap. Beyond the hotel rooms, food, and everything else involved in visiting Atlanta for a day or two, the seats themselves are wildly expensive. On average, Super Bowl ticket prices range between $3,000 and $6,000, according to TickPick.com's co-founder Brett Goldberg. Of course, as the game gets closer, a number of factors go into the whole economics of it all, namely which two teams end up facing off against one another. Also, unless you have an inside connection or get hooked up through work, the bulk of the tickets up for grabs now are only available through the resale market. At the time of publication, the cheapest ticket available on StubHub was $3,650 for a corner spot in the Upper Bowl, while the most expensive was a whopping $475,000 for a suite near the 20 yard line. Those prices, however, are far from the face value of the tickets. In 2018, face values for tickets to Super Bowl LII at US Bank Stadium in Minneapolis ranged between $950 and $5,000. Unfortunately, the only way you're going to end up paying face value for them this year is if you're an NFL Season Ticket holder. If you're a season ticket holder you're automatically entered into a lottery to have an opportunity to buy tickets at face value. Though, even then, preference is given based on things like whether your team is playing in the big game, how many seats you own, and the number of seasons you've owned them, according to Goldberg. As for how the tickets are specifically distributed, 17.5% of the tickets are given to each of the playing teams, 6.2% are given to the host team (this year, the Atlanta Falcons), and the remaining 29 teams split 33.6% evenly. The remaining 25.2% of tickets are then retained by the NFL, which then sells them to partners, media, and sponsors, per Goldberg. That is all to say, if you're gung-ho on going, expect to dole out at least a few grand. If you're serious about scoring a seat to the big game and prepared to drop a fat chunk of cash, you have plenty of options. Your best bet is to peruse the resale sites like StubHub, Vivid Seats, and TickPick. Right now, there are also some relatively affordable tickets for sale directly through the official NFL's ticket service, NFL On Location. Though, before you click "buy" you'd be wise to make sure you're familiar with the stadium layout so you know exactly what you're buying. As for when to pull the trigger on purchasing, it's tough to say at this point, though according to TickPick's analysis of Super Bowl ticket prices over the years, it seems as though buying about a week out may be the safest bet if you're hoping to get the best deal. Though don't wait too long, because according to Yahoo!, prices often creep back up again in the 72 hours before kickoff. At the moment, it's unclear exactly what the average ticket price will be for the 2019 Super Bowl, but last year it was $5,682, according to StubHub. And we're not saying shelling out that kind of dough for an evening of entertainment isn't worth it or anything, but just so you know, that's more than enough money to score yourself a nice little summer home in Italy right now.